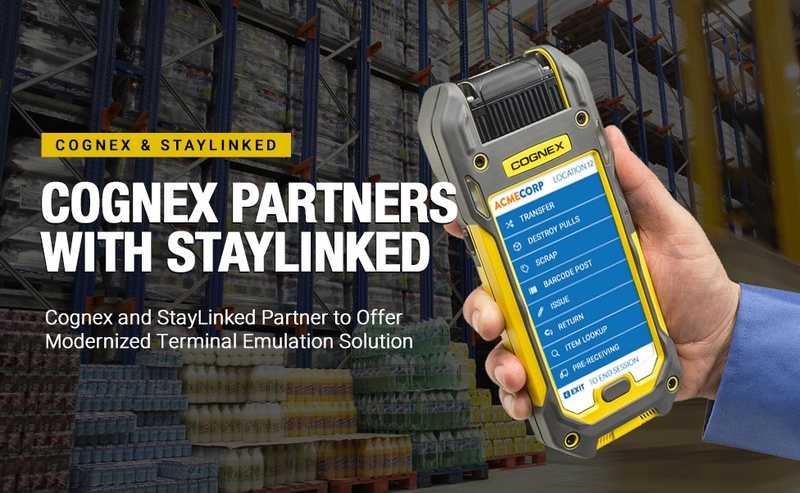 StayLinked and Cognex Corporation are proud to announce that we are now working together to offer StayLinked software on the Cognex series of ruggedized handheld computers, featuring the MX-1502 Series vision-enabled mobile terminal, the MX-1000 Series mobile barcode reader for rugged environments. The unique architecture of StayLinked Terminal Emulation connects mobile devices to host-based applications such as Warehouse Management Systems (WMS) and Enterprise Resource Planning (ERP) systems in a very reliable, secure, and high-performance manner. StayLinked SmartTE delivers the best possible user experience on touch-only devices allowing workers to utilize the entire screen, without sacrificing usability for the sake of screen space. Customers retain all their application's functionality, which enables seamless migration to Android and to new state-of-the-art Cognex handheld computers without ever having to touch the host application. Equipped with smart barcode reading algorithms and optics, the Cognex MX-1502 quickly adjusts between standard-, long-, and extended-range scanning to reliably decode 1-D, 2-D, and direct part mark (DPM) codes from as near as 15 centimeters to as far away as 10 meters. Like the MX-1000, the MX-1502 mobile terminal offers a modular, rugged design that supports iOS® and Android® devices and can be used in even the most challenging warehouse and factory floor environments. “Cognex is committed to developing innovative mobile solutions for our customers’ 1-D and 2-D barcode reading challenges,” said Bryan Boatner, Director of Sales and Product Marketing, ID Mobile. “With our full range of mobile scanning solutions, Cognex is uniquely positioned to help businesses leverage the latest mobile device technology to increase productivity and reduce costs. StayLinked gives our customers the ability to realize these goals using Cognex mobile solutions while leveraging their existing host applications. For light industrial, field service, and retail applications, the MX-100 mobile barcode reader redefines smartphone scanning performance. This Otterbox® uniVERSE Case System® mobile device accessory provides a built-in LED aimer and diffuse lighting to transform smartphones into better barcode readers. Paired with the Cognex Mobile Barcode SDK, the MX-100 supports a broad range of barcode symbologies. You may have seen some of the vendor-specific solutions that claim to modernize your backend application on your device with ease. But if you talk to anyone who has actually tried these software approaches, you’ll often hear the same refrain: It doesn’t work. At StayLinked, the folks we’ve talked to who are actively looking for an alternative are amazed at not only how well SmartTE works, but how easy it is to use. With StayLinked SmartTE and Cognex, you can quickly and easily apply touchscreen capabilities to your warehouse devices without ever touching the host application. We know that designing every single screen in your Terminal Emulation application is not only ambitious, it may not even be necessary. Using the Dynamic Screen Generator, SmartTE allows you to instantly 'buttonize' your menus, allowing them to be used on touchscreen devices easily and instantly. And StayLinked Works on Any Operating System! At StayLinked, we’ve worked hard to make sure that your legacy Terminal Emulation apps can take advantage of what Cognex devices have to offer, even without a hardware keyboard. That means that no matter what new hardware you decide to use, StayLinked SmartTE just works. Just as importantly, StayLinked works on every major operating system: Android, iOS, Windows10 and even Java. So when you decide which hardware and which OS to use in your warehouse, StayLinked is committed to making sure that your apps not only work better, but that you can focus on making tough hardware decisions without having to worry about which software to run. Because in the supply chain, as we all know, each warehouse is different.